Power quality and availability can vary from construction site to construction site, which is why commercial portable generators are a must for contractors. With a reliable power source, you'll be better positioned to get projects done on time, keep your tools running consistently, and limit downtime, all of which can combine to help make your business more profitable. 1. Will it satisfy my power requirements? How many tools do you run simultaneously? What are the power requirements of those tools (i.e. 240 and 120 Volt)? Base your selection on what’s used during a typical job to ensure that the generator you purchase will support your everyday power demands. 2. Does it provide clean, consistent power? Fluctuations in power directly affect equipment performance. If you have too little power, your tool may sputter or not run at full capacity. With too much power, you may overheat and short out critical components. Look for a generator that offers a low total harmonic distortion to protect your equipment and ensure that it operates at peak efficiency. Ideally, the generator’s harmonic distortion should be less than 5% during operation. 3. Can it be easily transported to a roof deck? 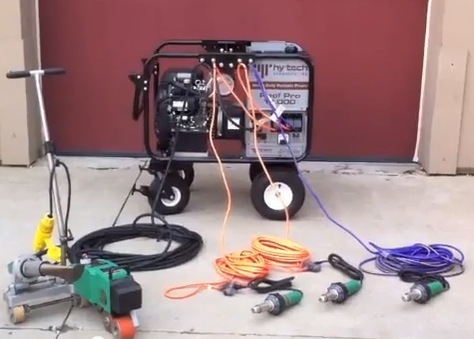 For projects that require power on a roof deck, make sure the portable generator you select offers features that support hoisting and passage through narrow doorways. If you have a hoist on site, a generator with a lifting eye is extremely valuable because it allows for easy transport to a deck without the need to fumble up stairs and through narrow hallways. This eye should be secured to a sturdy, metal frame for safe lifting. In addition, for those roof decks that offer freight or service elevator access, look for a generator that is narrow enough to fit through a standard 36-in doorway. 4. How long can it run before refueling? To avoid downtime caused by shutting down your generator to fill it with gas, purchase a generator that offers a large fuel tank. Standard generator tanks often hold between 8-10 gallons, whereas a large tank may hold upwards of 15 gallons. This translates to hours of additional runtime. For help selecting a generator that meets your construction-site power needs, contact one of our technical representatives at 800.635.0384, or email drains@hy-techroof.com.